Today, The Four Horsemen is a phrase often used to refer to several well-known atheists in various fields such as biology, journalism, philosophy, and neuroscience. There is a really enjoyable (at least for me) series of video recordings of discussions between Dawkins, Hitchens, Harris, and Dennett. I would highly recommend that any devout religious person watch with an open mind and really take to heart the points they make about the poor arguments made in favor of religious devotion. Though I am a devout religious person myself, I have been very happy to engage with the so-called "New Atheists" where I thought it was worthwhile. I wrote a review of the Sam Harris' recent book entitled Waking Up, addressing each of its five chapters individually. These are not the only atheists I've engaged with, of course. Others include Jerry Coyne, Peter Singer and Friedrich Nietzsche, the last of whom I defended against the charge of anti-Semitism. Jerry Coyne has pointed out that there is nothing new about atheism, a claim I have wholeheartedly endorsed in previous writings exploring why it is difficult for us to believe in God. Though I often find value in engaging with those who are called "New Atheists" and their followers, I would like to give credit to four other individuals who, at least in my view, played a decisive role in the contemporary strength of atheism as a part of a more popular cultural movement, In terms of the powerful consequences of their thought for the prevalence of atheism as it stands now, I'm inclined to see the following fellows as the Four Horsemen of the "new" atheism. Death may indeed be a pale horse, but I submit that it's a fair descriptor for a pale German philosopher named Friedrich Nietzsche, a man who declared that God was dead and that we were guilty of his murder. He is also a man who charged religions with being against life itself. And not just in the all too easy sense that religions sometimes practice animal or human sacrificial killing. Or that religions generally propose a life after death, which can, if left unchecked by a belief in the sanctity of life, lead to a tragic diminishing of the value of this life. "There is a great ladder of religious cruelty, with many rounds; but three of these are the most important. Once on a time men sacrificed human beings to their God, and perhaps just those they loved the best--to this category belong the firstling sacrifices of all primitive religions, and also the sacrifice of the Emperor Tiberius in the Mithra-Grotto on the Island of Capri, that most terrible of all Roman anachronisms. Then during the moral epoch of mankind, they sacrificed to their God the strongest instincts they possessed, their 'nature'; this festal joy shines in the cruel glances of ascetics and 'anti-natural' fanatics. Finally, what still remained to be sacrificed? Was it not necessary in the end for men to sacrifice everything comforting, holy, healing, all hope, all faith in hidden harmonies, in future blessedness and justice? Was it not necessary to sacrifice God himself, and out of cruelty to themselves to worship stone, stupidity, gravity, fate, nothingness? To sacrifice God for nothingness--this paradoxical mystery of the ultimate cruelty has been reserved for the rising generation; we all know something thereof already." Nietzsche rightly disdained the needless death of a man's loved ones by his own hands. He also wrongly suggested that the sacrifice of God and the subsequent worship of brute facts followed straightforwardly from the previous forms of sacrifice. But in the middle, it's a bit more muddled. He proposes that the sacrifice of the instincts, that great well of transient desires, is indicative of an aversion to the immense wonder of this life; this he sees as a grave problem, if you will excuse the morbid turn of phrase, with religion. He is quite right that to be opposed to natural life is a grave problem; he is quite wrong that the practice of self-denial in asceticism is performed out of an opposition to this natural life, at least in the vast majority of cases in Christianity and Buddhism, which he uses as examples. As I've mentioned before, he just so happened to be wrong about the facts of those religions, much as I sympathize with his reasoning. In another arena, however, he got other facts about the relationship between death and religion exactly right. "Has it been observed to what extent outward idleness, or semi-idleness, is necessary to a real religious life (alike for its favourite microscopic labor of self-examination, and for its soft placidity called 'prayer,' the state of perpetual readiness for the 'coming of God'), I mean the idleness with a good conscience, the idleness of olden times and of blood, to which the aristocratic sentiment that work is dishonouring--that it vulgarises body and soul--is not quite unfamiliar? And that consequently the modern, noisy, time-engrossing, conceited, foolishly proud laboriousness educates and prepares for 'unbelief' more than anything else? Amongst these, for instance, who are at present living apart from religion in Germany, I find 'free-thinkers' of diversified species and origin, but above all a majority of those in whom laboriousness from generation to generation has dissolved the religious instincts; so that they no longer know what purpose religions serve, and only note their existence in the world with a kind of dull astonishment. They feel themselves already fully occupied, these good people, be it by their business or by their pleasures, not to mentioned the 'Fatherland,' and the newspapers, and their 'family duties'; it seems that they have no time whatever left for religion; and above all, it is not obvious to them whether it is a question of a new business or a new pleasure--for it is impossible, they say to themselves, that people should go to church merely to spoil their tempers. They are by no means enemies of religious customs; should certain circumstances, State affairs perhaps, require their participation in such customs, they do what is required, as so many things are done--with a patient and unassuming seriousness, and without much curiosity or discomfort;--they live too much apart and outside to feel even the necessity for a for or against in such matters." He was able to identify that it is not persecution which is the death of religion; nor is it science, nor lofty rationality. The death of religion is popular indifference, indifference driven by absorption in the daily business of life and the gentle pleasures which steady labor can attain for us in orderly societies. Asceticism prevents this death of religion by taking us out of our reliance on those gentle pleasures and requiring us to observe what he calls the idleness of prayer; without asceticism, religion dies the quiet death of being reduced to a meaningless collection of customs. "Among those indifferent persons may be reckoned nowadays the majority of German Protestants of the middle classes, especially in the great laborious centres of trade and commerce; also the majority of laborious scholars, and the entire University personnel (with the exception of the theologians, whose existence and possibility there always give psychologists new and more subtle puzzles to solve). On the part of pious, or merely church-going people, there is seldom any idea of how much good will, one might say arbitrary will, is now necessary for a German scholar to take the problem of religion seriously; his whole profession (and as I have said, his whole workmanlike laboriousness, to which he is compelled by his modern conscience) inclines him to a lofty and almost charitable serenity as regards religion, with which is occasionally mingled a slight disdain for the 'uncleanliness' of spirit which he takes for granted wherever anyone still professes to belong to the Church. It is only with the help of history (not through his own personal experience, therefore) that the scholar succeeds in bringing himself to a respectful seriousness, and to a certain timid deference in presence of religions; but even when his sentiments have reached the stage of gratitude towards them, he has not personally advanced one step nearer to that which still maintains itself as Church or as piety; perhaps even the contrary. The practical indifference to religious matters in the midst of which he has been born and brought up, usually sublimates itself in his case into circumspection and cleanliness, which shuns contact with religious men and things; and it may be just the depth of his tolerance and humanity which prompts him to avoid the delicate trouble which tolerance itself brings with it. -- Every age has its own divine type of naivete, for the discovery of which other ages may envy it: and how much naivete--adorable, childlike, and boundlessly foolish naivete is involved in this belief of the scholar in his superiority, in the good conscience of his tolerance, in the unsuspecting, simple certainty with which his instinct treats the religious man as a lower and less valuable type, beyond, before, and above which he himself has developed--he, the little arrogant dwarf and mob-man, the sedulously alert, head-and-hand drudge of 'ideas,' of 'modern ideas'!" The sharply observant Nietzsche notes that the man indifferent to religion is himself reductively religious; he has reduced religion to irrelevant though harmless customs which are nonetheless worthy of observance for no good reason, a phenomenon to be tolerated with quiet condescension in those who take it seriously. In his avoidance of the difficult matter of engaging directly with religion, he treats it also as beyond good and evil; he places it on a shelf to be preserved as a charm or trinket to become a museum piece, not understanding its danger to him or its power over him. By way of turning religion into something to be tolerated, to be avoided if possible, or to be accepted as a cultural practice emptied of its meaning, the man of modern ideas has turned religion into what William James might call a "dead option." His respect of religion is much the same as the respect a young man offers to the fallen soldiers of the previous age; it is the respect we have for the dead, the dead we never truly knew. It is not enough for everyone to propose that religion is wrong, terrible and beautiful though it may be. A yet more ingenious attack is to starve it of the terrible and beautiful parts which give it a sort of grand meaning, to gradually put to waste the richness of meaning upon which religions subsist. For this, we need one of the psychologists, a group Nietzsche helpfully pointed out to us as investigators of the oddity of theology, that antiquated discipline of studying the ways of God to Man. We need a man educated in neuropathology who can explain the genesis of our beliefs about God in such a way that we have no further need of recourse to explaining those beliefs by way of anything external to ourselves, a parsimonious explanation which any reasonable person can accept. "What is the psychological significance of religious ideas and how can we classify them? The question is at first not at all easy to answer. Having rejected various formulas, I shall take my stand by this one: religion consists of certain dogmas, assertions about facts and conditions of external (or internal) reality, which tell one something that one has not oneself discovered and which claim that one should give them credence. As they give information about what are to us the most interesting and important things in life, they are particularly highly valued. He who knows nothing of them is considered ignorant indeed, and he who has assimilated them may consider himself enriched. There are of course many such dogmas about the most diverse things of this world. Every school hour is full of them. Let us choose geography. We hear there: Konstanz is on the Bodensee. A student song adds: If you don't believe it go and see. I happen to have been there, and can confirm the fact that this beautiful town lies on the shore of a broad stretch of water, which all those dwelling around call the Bodensee. I am now completely convinced of the accuracy of this geographical statement. And in this connection I am reminded of another and very remarkable experience. I was already a man of mature years when I stood for the first time on the hill of the Athenian Acropolis, between the temple ruins, looking out on to the blue sea. A feeling of astonishment mingled with my pleasure, which prompted me to say: then it is really true, what we used to be taught at school! How shallow and weak at that age must have been my belief in the real truth of what I heard if I can be so astonished to-day! 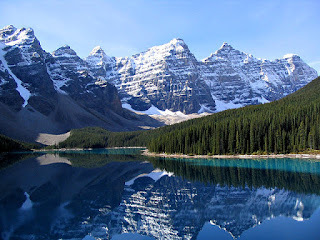 But I will not emphasize the significance of this experience too much; yet another explanation of my astonishment is possible, which did not strike me at the time, and which is of a wholly subjective nature and connected with the peculiar character of the place." The psychologist here recognizes the power of religion, but only in terms of its power to shape our mental lives. He dares not assert that religion does anything else; religion is neutered from the start. The religion about which he writes is religion which is a set of ideas which can be understood completely in the form of propositions, the possession or lack of which has temporal social consequences for us rather than eternal consequences. He then establishes the same principle as the Apostle Thomas did in the Gospel of Doubt, that it is not only justified to believe once we see for ourselves, but that it is the best form of belief, other beliefs less viscerally evidenced being of lower value. "All such dogmas as these, then, exact belief in their contents, but not without substantiating their title to this. They claim to be the condensed result of a long process of thought, which is founded on observation and also, certainly, on reasoning; they show how, if one so intends, one can go through this process oneself, instead of accepting the result of it; and the source of the knowledge imparted by the dogma is always added, where it is not, as with geographical statements, self-evident. For instance: the earth is shaped like a globe; the proofs adduced for this are Foucault's pendulum experiment, the phenomena of the horizon, and the possibility of circumnavigating the earth. Since it is impracticable, as all concerned realize, to send every school child on a voyage round the world, one is content that the school teaching shall be taken on trust, but one knows that the way to personal conviction is still open." The other way of arriving at belief, he assures us, is valid so long as we could see, in principle, whatever is it that we are proposing exists. When Freud weighs the scales of evidence, he sees the side holding that which is in principle observable sitting lower than that which is not in principle observable. This is intuitively attractive, of course. We understandably prefer to believe in that which we can experience for ourselves; it feels more solid and certain, providing us with a sense of security in our belief, a sense of security which our belief in the roundness of our planet might never have. We wish for that which is certain, that which cannot be overturned; we long for the reliable, stable truth. This third point cannot but rouse our strongest suspicions. Such a prohibition can surely have only one motive: that society knows very well the uncertain basis for the claim it makes for its religious doctrines. If it were otherwise, the relevant material would certainly be placed more readily at the disposal of anyone who wished to gain conviction for himself." Freud seeks that same certainty he found upon viewing the Acropolis when he examines religion, and does not find it. And what is worse, those who give him reasons for their belief provide him with shaky ones. Their reasons do not evoke the stable sort of belief which provide a sense of security in certainty. He is convinced, by what reason I have not found, that the important claims of religions cannot be substantiated by observation; thus religion lacks the certainty he seeks and he cannot believe it. Now his suspicions are raised; like so many modern people, Freud assumes that if some religious people are opposed to questioning, then religion as a whole is opposed to questioning. Rightly, he sees this as a serious problem. Interestingly, he assumes that this opposition to questioning is motivated by a lack of the certainty he so desires on the part of the believer, projecting his own desires for certainty onto them as an insecurity. Thomas Aquinas, who wrote a rather lengthy set of answers to those questions Freud believed to be verboten many centuries before when the Catholic Church had a great deal of power over the continent, might have understandably been quite confused about why Freud thought this to be so. Why would he write such a volume and publish it if there was no one asking the questions or willing to answer them? "And so we proceed to test the other two arguments with a feeling of mistrust not easily allayed. We ought to believe because our forefathers believe. But these ancestors of ours were far more ignorant than we; they believed in things we could not possibly accept to-day; so the possibility occurs that religious doctrines may also be in this category. The proofs they have bequeathed to us are deposited in writings that themselves bear every trace of being untrustworthy. They are full of contradictions, revisions, and interpolations; where they speak of actual authentic proofs they are themselves of doubtful authenticity. It does not help much if divine revelation is asserted to be the origin of their text or only of their content." The next part of his response to those believers he has interviewed would not be out of place on any online message board of the past twenty years, at least while setting aside its eloquence and focusing on its substance. The psychologist quite rightly understands that if the holy texts of a religion are untrustworthy, and the holy texts contain all of the observational evidence for their religion's truth claims, then even if the observational evidence is trustworthy, it is nonetheless suspect because it is in an untrustworthy text. Understandably, the texts of ancient religions are difficult to parse without knowing the original language, the literary style being employed, the author's intent, the commentaries and critiques of his contemporaries, and numerous other factors. Even texts written only a few centuries before are often odd and indecipherable without fairly extensive research, and they generally don't reflect the latest scientific consensus on matters of physics, just as Freud's do not reflect the latest consensus on psychology. Though it is in principle possible for many people to perform the research necessary to understand the texts and decide the question of their authenticity, why would we do so when it is far easier to dismiss them as dubious on the basis of our uncertainty? But at present they still behave quite differently, and in past ages, in spite of their incontrovertible lack of authenticity, religious ideas have exercised the very strongest influence on mankind. This is a fresh psychological problem. We must ask where the inherent strength of these doctrines lies and to what circumstances they owe their efficacy, independent, as it is, of the acknowledgement of the reason." Freud's prophetic prediction has come true; there are now increasingly large numbers of people who regard religions are fairy tales and turn away from them with an air of disdain. But there are still those who are strongly influenced by them in every aspect of their lives, and he wants to find a satisfactory psychological explanation for it. This is especially urgent in light of their not being subject to human reason as Freud understands it. He believes that our beliefs ought to be grounded in, or at least re-shaped by, reason. It is increasingly apparent from contemporary studies of human cognition that this is not how our brains normally work, that in general they begin by working backward to find a reason for the correctness of our existing beliefs. I happen to agree with Freud that we should aspire to have well-reasoned conclusions for our beliefs. Nonetheless, the evidence of human cognitive function gathered by extensive observation suggests to me that we should not be quick to cast aspersions on those who don't, because it is actually the normal way for our minds to work. Those of us who relatively frequently work from premise to conclusion, rather than from conclusion to premise, are perhaps the more truly fresh psychological problem. "I think we have sufficiently paved the way for the answer to both of these questions. It will be found if we fix our attention on the psychical origin of religious ideas. These, which profess to be dogmas are not the residue of experience or the final result of reflection; they are illusions, fulfillments of the oldest, strongest and most insistent wishes of mankind; the secret of their strength is the strength of these wishes. We know already that the terrifying effect of infantile helplessness aroused the need for protection--protection through love--which the father relieved, and that the discovery that this helplessness would continue through the whole of life made it necessary to cling to the existence of a father--but this time a more powerful one. Thus the benevolent rule of divine providence allays our anxiety in face of life's dangers, the establishment of a moral world ensures the fulfillment of the demands of justice, which within human culture have so often remained unfulfilled, and the prolongation of earthly existence by a future life provides in addition the local and temporal setting for these wish-fulfillments. Answers to the questions that tempt human curiosity, such as the origin of the universe and the relation between the body and the soul, are developed in accordance with the underlying assumptions of this system; it betokens a tremendous relief for the individual psyche if it is released from the conflicts of childhood arising out of the father complex, which are never wholly overcome, and if these conflicts are afforded a universally accepted solution." The answer is finally given to us, an answer in the same vein of what we hear today from fine skeptics like Michael Shermer: religious belief is motivated by a strong desire to fulfill wishes we harbor for our entire lives, and these wishes are rooted in our childhood traumas. Freud quite correctly notices that having a loving Father in Heaven fills a psychological need; like Nietzsche, he was ignorant of other religions, and to such a degree that he was not able to notice that this conception of God as a loving Father was far from universal among religions, and that his explanation would only make any sense for a small subset of religion as a category. Not to mention that most psychological security blankets composed of an imaginary loving father would probably not include the strong possibility of your loving father sending you to everlasting torment if it was merely a case of psychological wish-fulfillment. There are evidential holes in his theories large enough to drive a chariot of fire through. So why was this all so convincing for Freud? He wanted to find a simple explanation for the phenomenon of religious belief which did not require a serious, multidisciplinary study of human cognition and human evolution. And he fulfilled his own wish, creating a narrative which explained (in light of what little was known of the human mind during his time) in a way which neatly justified his existing beliefs about religion while failing to ask the questions or research the information which might reveal it to be false. The simplicity of the psychologist's theory was insufficiently simple for some, and so we turn to the natural scientist, Ludwig Feuerbach. His specialties were anthropology and philosophy, specialties which provided him with the background to evaluate theological claims within the philosophical methodologies and in light of the evidence of natural science available to him at the time. In The Essence of Christianity, he sets out to conquer the land of Christian theology and philosophy, claiming it for the post-Christian age which could not tolerate the fixed dogmas set as a firm foundation for the theological and philosophical disciplines. His Hegelian training had prepared him well to argue that Christianity would and should be subject to supersession just as Christianity proposed to supersede Judaism, and he set about the task with a strong will to finish it. "Nature has no beginning and no end. Everything in it acts upon everything else, everything in it is relative, everything is at once effect and cause, acting and reacting on all sides. Nature does not culminate in a monarchic summit; it is a republic. Those who are accustomed to a monarchy cannot conceive of human society without a prince, and likewise those who have grown up with the idea of a Father in Heaven find it hard to conceive of nature without a God. But it is just as possible to conceive of nature without a God, without an extranatural or supernatural being, as of a state or nation without a royal idol situated outside and above it. Indeed, just as the republic is the historical task, the practical goal of man, so his theoretical goal is to recognize the republican constitution of nature, not to situate the governing principle of nature outside it, but to find it grounded in nature. Nothing is more absurd than to regard nature as a single effect and to give it a single cause in an extra-natural being who is the effect of no other being. If I cannot refrain from spinning out fantasies, from looking further and further afield, if I am unable to stop with nature and content my intellectual need for causes with the universal action and interaction of nature, what is to prevent me from going beyond God? What is to prevent me from looking for a ground and cause of God as well? Do we not in God find the same situation as in the concatenation of natural causes and effects, the very situation that I wished to remedy by positing the existence of God?" For Feuerbach, the first cause of the cosmological argument was an insatiable curiosity. Like contemporary advocates of materialism, he sees no need to look beyond nature itself for the cause of nature. He seems to depict it as a closed system in perpetual motion of some kind, much like the Jain cosmology. An uncaused cause is a bit of facial hair on the face of philosophy, to be shaved away quickly with Occam's Razor. No matter how little sense it makes to ask of the cause of what is, by definition, the uncaused cause... It makes even less sense to Feuerback to imagine some sort of divine dictatorship, as Christopher Hitchens might have put it; Feuerbach and those who have inherited his philosophical arguments have a cosmology of much greater liberty and equality than those poor medieval saps and those withering ignorant ancients who thought of the cosmos as a great chain of being. But for that very reason, because the First Cause is a mere intellectual concept or entity without objective existence, it also is not the cause of my life and existence. This cause is of no use to me; the cause of my life is the sum of many different, definite causes; the cause, for example, of my breathing is subjectively my lungs, objectively the air; the cause of my vision is objectively the light, subjectively my eyes. In short, the First Cause is an unprofitable abstraction. From this first cause that causes nothing I therefore turn back to the more profitable theme of nature, the sum of real causes, and try once again to prove that we must confine ourselves to nature as the ultimate ground of our existence; that all derivations from nature which transcend nature to arrive at a nonnatural being are mere fantasies and delusions. The proofs are both direct and indirect; the direct proofs are drawn from nature and relate to it directly; the indirect ones show the contradictions involved in the contrary assumption and the absurd consequences that follow from it." Here our natural scientist begins to tease out the answer, gradually building the worldview which will supersede the Christian worldview. He proposes that the cause of our need for questioning the further causes of causes is the intellect; for Feuerbach, the intellect is indirectly the cause of all belief in God, the cause of all theistic speculations and delusions. This first cause of all God-bothering is as obvious to him as the First Cause of all Being was to Aquinas. Or is the first cause perhaps nature itself? In an interesting move in light of his previous point, Feuerbach suggests that nature is one despite being composed of many definite causes; he abstracts the generalized sum of causes he calls "nature" from the set of particular, definite causes and phenomena he experiences in the world. What's more, he seems to suggest that this "nature" abstracted from diverse phenomena is the First Cause, the uncaused cause of God. "Our world--not only our political and social world, but our learned, intellectual world as well--is a world upside down. The great achievement of our education, of our culture, our science, our erudition has been, above all, to stray as far as possible from nature, from the simple palpable truth. It is a universal principle of this upside-down world that God manifests Himself in nature, whereas we should say the opposite, namely, that originally at least nature manifests itself to man as a God, which he becomes conscious of and objectifies under the name of God. It is a universal doctrine in our upside-down world that nature sprang from God, whereas we should say the opposite, namely, that God was abstracted from nature and is merely a concept derived from it; for all the predicates, all the attributes or determinations, all the realities, as the philosophers say, that is, all the essences or perfections which are summed up in God, or whose totality is, or is called, God--in short all those divine predicates that are not borrowed from man, are derived from nature, so that they objectify, represent, illustrate nothing other than the essence of nature, or nature pure and simple. The difference is only that God is an abstraction, that is, a mere notion, while nature is concrete, that is, real; but the essence, the substance, the content are the same; God is nature in the abstract, that is, removed from physical perception, transformed into an object or concept of the intellect; nature itself is sensuous, real nature as directly revealed and communicated to us by the senses." This is a popular contemporary claim made by atheists; many atheists go farther than Freud, reducing, as Feuerbach did, the grand cosmology of Christianity to less than ever. No longer consigned to the starvation diet of understandable psychological meaning, religion is now meaningless, its meaning emptied into the bowl of nature to be consumed at will by those who seek to make it more palatable by taking the last bit of the flavor of human meaning out of it. Now we see the end: the inversion, as before, of the Christian worldview. Feuerbach strides forward and sets Nature's flag upon the field, claiming that rather than nature being created out of nothing by God, God was created out of nature by Man. This is the beginning of the increasingly popular view in contemporary societies that all religion is merely a man-made fabrication whose weave is held together by strands of blatant falsehood, useless old ideas, and harmless fairy tales. And this makes perfect sense in light of the available options; over the past couple of centuries, the death of God in the minds of persons has often led either to the deification of Nature or the deification of the State, and more specifically, a state which is at least nominally in favor of equality and opposed to the hierarchy of monarchy, such as a republic which followed the death of the king. The new Monarch, who is Nature Herself, has come, has seen, and has conquered. Meet the new Monarch, same as the old Monarch. This ancient deity called Nature presented as new again is not enough for those whose hearts burn in the fires of passion for a justice which has never been attained in any human society. The State alone will serve as the new deity, a deity which will be ultimately sacrificed for the redemption of humanity as a collective whole. The sacrifice of the State will, in the end, bring about the justice they seek. Karl Marx envisioned this just society as the State which had thrown off the shackles of class altogether by means of socialism, bringing about the communist ideal of an end to capitalism, replacing it with a free association of producers. For Marx, the shackles of religion must be thrown off as well, being the means by which the populace is kept placid and malleable, safely ensconced in the economic shackles made by their capitalist oppressors. Here in the essay Contributions to the Critique of Hegel's "Philosophy of Right" he begins the work of tearing off the shackles of religion by noting that the criticism of religion is already done. His purpose is not to criticize, but to abolish. The basis of irreligious criticism is this: man makes religion; religion does not make man. Religion is indeed man's self-consciousness and self-awareness so long as he has not found himself or has lost himself again. But man is not an abstract being, squatting outside the world. Man is the human world, the state, society. This state, this society, produce religion which is an inverted world consciousness, because they are an inverted world. Religion is the general theory of this world, its encyclopedic compendium, its logic in popular form, its spiritual point d'honneur, its enthusiasm, its moral sanction, its solemn complement, its general basis of consolation and justification. It is the fantastic realization of the human being inasmuch as the human being possesses no true reality. The struggle against religion is, therefore, indirectly a struggle against that world whose spiritual aroma is religion." Here we hear the echos of Feuerbach from his follower; Marx was indeed baptized in the feuerbach. He recapitulates, briefly, Ludwig the Baptist's arguments. But this is not his primary purpose; Feuerbach had parted the veil to reveal that religion was empty of meaning; Marx would do no less than tear the veil in two from top to bottom so that the demystification of the mysteries of religion would be complete. "Religious suffering is at the same time an expression of real suffering and a protest against real suffering. Religion is the sigh of the oppressed creature, the sentiment of a heartless world, and the soul of soulless conditions. It is the opium of the people. The abolition of religion as the illusory happiness of men, is a demand for their real happiness. The call to abandon their illusions about their condition is a call to abandon a condition which requires illusions. The criticism of religion is, therefore, the embryonic criticism of this vale of tears of which religion is the halo." Marx's demystification process begins by advising us that religion is a drug, a drug used (like many drugs) to self-medicate, to treat the symptoms of a deeper wound. Though the withdrawal symptoms will be painful, Marx is confident that our true happiness lies not in the drug, but in alleviating the causes of our need for the drug. Eloquent and compelling as always, he prophesies that when religion is abandoned, so too the causes which make it so appealing it to us will be abandoned, leaving us truly happy in our future home. And what is this true happiness we find at the end of history's road? "Criticism has plucked the imaginary flowers from the chain, not in order that man shall bear the chain without caprice or consolation but so that he shall cast off the chain and pluck the living flower. The criticism of religion disillusions man so that he will think, act, and fashion his reality as a man who has lost his illusions and regained his reason; so that he will revolve about himself as his own true sun. Religion is only the illusory sun about which man revolves so long as he does not revolve about himself." Here Marx agrees briefly with the religious man, who asserts that for man to abandon service to God leads inevitably to man putting himself in service first to the self. But they quickly part ways; for the religious man sees God as a live option and Marx sees the religion of God as the shackles holding us back from living. "It is the task of history, therefore, once the other-world of truth has vanished, to establish the truth of this world. The immediate task of philosophy, which is in the service of history, is to unmask human self-alienation in its secular form now that it has been unmasked in its sacred form. Thus the criticism of heaven is transformed into the criticism of earth, the criticism of religion into the criticism of law, and the criticism of theology into the criticism of politics." For Marx, all the signs and symbols of religion must by reduced to something less so that the shackles lose their weight and can be thrown off. Or more to the point, it is inevitable that in the course of history that they be thrown off. Only then can the only real heaven be revealed as the earth, the only real religion as law, and the only real theology as politics. The only real God is thus revealed to be the State. But war upon the state of affairs in Germany! By all means! This state of affairs is beneath the level of history, beneath all criticism; nevertheless it remains an object of criticism just as the criminal who is beneath humanity remains an object of the executioner. In its struggle against this state of affairs criticism is not a passion of the head, but the head of passion. It is not a lancet but a weapon. Its object is an enemy which it aims not to refute but to destroy. For the spirit of this state of affairs has already been refuted. It is not, in itself, an object worthy of our thought; it is an existence as contemptible as it is despised. Criticism itself has no need for any further elucidation of this object, for it has already understood it. Criticism is no longer an end in itself, but simply a means; indignation is its essential mode of feeling, and denunciation its principal task." History has already decided, according to the venerable bearded prophet. This current world is going to pass away, and there is no real need to criticize for the purpose of fraternal correction. The prophets of Israel called people back to God, but the prophet of communism calls us to the Revolution, to revolt against the enemy, an enemy who must be destroyed by any means necessary. The prophet of communism cries, "Ich muss zerstören!" Marx is the enemy of the state as it stands now, but he is the harbinger of the end of the State, the temporary reign of which will mark the final end of the State. The Law which replaced religion will be no longer. The Politics which replaced theology will be no longer. The State will be no longer; all oppression will have ceased. Marx must posit that the new God (the State) is again killed by those he came to deliver from oppression and by those who have attained a just society with his support. The new God will triumph, and the Lamb, that pitiful sheep which is a society of people led easily by the shepherd of religion, would be led to the slaughter, bathed in the blood of revolution, martyred so that Man might finally have the idyllic earth in whose image he made heaven, the imago caeli. Marx is the prophet of justice predicting and advocating a bloody revolution, followed by a socialist state, which would then be superseded by the classless society: a utopia. His hoped-for utopia has so far turned out to be an illusion, and the justice of the real heaven here on earth yet eludes us. 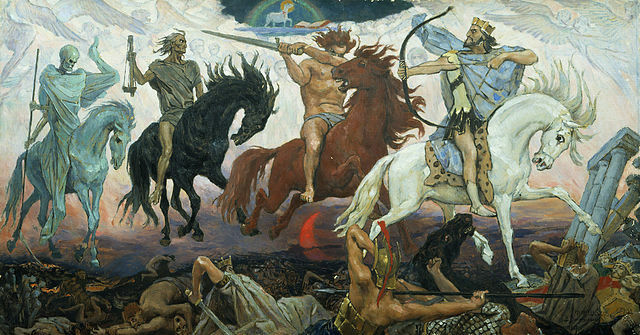 In the Apocalypse from which the appellation is taken, The Four Horsemen are ultimately signs of hope for the triumph of God; they foreshadow the end of the enemies of the Church. In the same way, the Four Horsemen of Atheism are ultimately signs of hope for the triumph of atheism; they foreshadow the end of the enemies of the Church of Reason. First, religion is deemed tolerable. Second, religion is deemed a psychological ailment in need of treatment, a delusion. Third, religion is deemed to be mere words, empty signifiers which are reducible to nature. Fourth, religion is to be offered as a sacrifice so that the State might have life abundantly and then die so that Heaven can be reached. Nietzsche is the herald of the death of religion, Freud starves religion of meaning, leaving it emaciated, Feuerbach removes its meaning completely, leaving it eviscerated and conquered, and Marx prophesies the slaughter of false religion so that we might follow the true religion, which is merely Law, the Law which is fulfilled when the law is abolished by the Lawgiver who no longer has need of it because the illusory Kingdom of Heaven on the real earth is at hand. The Final Judgment follows the appearance of the Four Horsemen; only those deemed worthy to enter into the new heaven on earth will reach Paradise: those who followed the teachings of the prophet, those who were baptized in the brook of fire, and those who accepted their redemption by the sacrifice of the true God, the State.